About 100 French politicians have marched on a street in a Paris suburb in protest at Muslims holding Friday prayers in public. 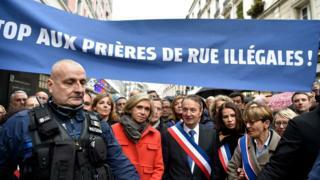 The politicians, wearing tricolour sashes of office and singing the national anthem, disrupted about 200 worshippers on a street in Clichy. Police kept the two groups apart but some scuffles broke out. Critics say the prayers are an unacceptable use of public space in France's strictly secular system. The worshippers, however, say they have nowhere else to go since the town hall took over the room they used for prayers back in March. France has about five million Muslims - the largest Muslim minority in Western Europe. "Public space cannot be taken over in this way," said Valérie Pécresse, president of the Paris regional council, who led Friday's protest by councillors and MPs mainly of the centre-right Republicans and UDI parties. Rémi Muzeau, the right-wing mayor of Clichy, called on the interior ministry to ban the street prayers, adding: "I am responsible for guaranteeing the tranquillity and freedom of everyone in my town." One of the worshippers, named only as Abdelkader, told AFP news agency that they wanted a "dignified" place to worship and did not enjoy being in the street every Friday. He said he resented the politicians singing the French national anthem during their protest. "They were singing the Marseillaise, throwing it in our faces, even though we're French people here. We're French. Long live France!" he said.